The brand Chanel is synonymous with elegance and class. The new short film by the house's creative director Karl Lagerfeld is anything but. The film Reincarnation premiered at Chanel’s Métiers d'Art 2014/15 Paris-Salzburg show last Tuesday. It stars model du jour Cara Delevingne as a dirndl-clad hotel maid moonlighting as a reincarnation of Empress Sisi of Austria. Pharrell Williams is a lift boy whose uniform inspires Coco Chanel to create the famous Chanel jacket (the story is based on a true event). Reincarnation is reminiscent of Lagerfeld’s 2011 attempt at filmmaking. The Tale of a Fairy is a 25-minute display of pretension and hilarious banality, featuring a gang of Chanel muses engaging in melodramatic dialogue. Reincarnation occupies the same territory of affectation. Lagerfeld’s intention to tell the story behind the Chanel jacket takes a back seat to the trite plot with Pharrell and Cara Delevingne. The lack of a sensible narrative is intensified by amateur acting. Geraldine Chaplin (Coco Chanel) is the only one who makes the effort to act. Pharrell is stiff as a poker and Cara Delevingne is simply being Cara Delevingne, making grimaces and causing mayhem. A reincarnation of Empress Sisi, she exudes zero melancholy of the woman who wrote depressing poetry and kept running away from suffocating court life (read more about Sisi's life and wardrobe in this post). Even if you turn a blind eye to the shallow interpretation of history, Reincarnation is a gift that keeps on giving. The manipulated portraits of Empress Sisi and Emperor Franz Josef I are on the level of the botched restoration of the painting Ecce Homo in Spain. At 6:07, the cringeworthy freestyle dance makes the average Joe look like a king of the dance floor. And that kid chanting “CC/Sisi” is a thing of nightmares. It’s disappointing that with the bazillion euro budget and a production crew the size of a small European town, the result is so awkward and unworthy of Chanel. Next time please hire Baz Luhrmann again. I agree. That really wasn't good. It wasn't even near good. If for no other reason, this was worth for seeing Cara Delevingne on screen. She has a real charisma and her singing is lovely. 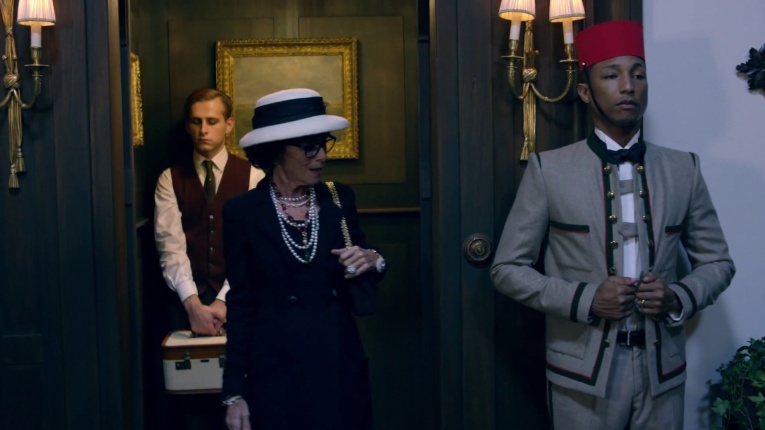 The whole thing reminds me of Felini, Lady Gaga and Budapest Hotel. Absurd yet beautiful. Well, Karl Lagerfeld is German, so I suppose that explains the leiderhosen and tavern girl costumes. I agree with you. No glamour, no romance, no elegance.